This renovated home (inside and outside) is spotlessly clean and has four lovely air conditioned bedrooms (all new bedroom air conditioners in July 2018) with very comfortable beds and cable flat screen TV's, a large front to back air conditioned sunken living room (everyone in your group must be able to take two steps down into the sunken living room) with a 47' HDTV, DVD player, a chess table, and a very large inventory of movies (DVD and VHS). This house is perfectly located mid-cape, an easy drive to anywhere on Cape Cod and a short drive to Shaw's, Stop & Shop, Friend's Market, and a wonderful store to buy fresh local fish. The bright kitchen has 2 convection ovens, microwave, and is supplied with everything you need including quality cookware and spices, a lobster pot and tools for breaking apart ans eating the lobsters. So much fun! The house has a large refrigerator with an ice maker, a dish washer (detergent supplied), a fast heating electric cook top, and over-sized washer & dryer. There is a large deck in the private backyard with a huge Weber gas grill, quality comfortable deck furniture, an outside shower, and a lovely raised garden with a 2-person settee. There is a wonderful patio in the front yard with two very comfortable rocking chairs and a 2-person glider, a great place for morning coffee and watching the birds. The property has rights to a small private swimming pond. Flax Pond in Nickerson State Park (great for swimming or fishing) is 15-20 min. walk down a quiet dirt road that can be accessed behind our property. Our house is very close to both bay and ocean side beaches and many excellent restaurants. We installed a high capacity washer and dryer, refrigerator, and dishwasher.There are games, books, and puzzles for all ages.The backyard has an outdoor shower (anti-scald), a lovely garden with a two-person Adirondack settee, a deck with a large table that seats 8 adults, comfortable furniture, and a huge Weber gas grill. The house has wireless internet, cable TV, and land-line phone service. There will be a supply of spices, paper and cleaning products when you arrive. In the garage you will find 2 adult bikes (ride at your own risk), a horseshoe set, wiffle balls and bats, frisbees, a set of golf clubs, and a large supply of golf balls, at least 8 beach chairs, 3 beach umbrellas and sand stakes to keep the umbrellas safely anchored, igloo and soft sided coolers, beach toys, and a beach cart for helping you to get beach chairs and towels from your car to the beach. Guests supply their own linens and towels. Maximum occupancy is 8. Minimum age for signer of lease is 30 years old. Pets, smoking, tents, fireworks, and fires are not permitted in the house or on the property. Thank you very much for considering renting our house for your vacation on Cape Cod! Beaches and other great things to do in Brewster : If you love the beach, you'll love Brewster! Five of the most picturesque beaches on Cape Cod Bay are in Brewster - Crosby Landing, Ellis Landing, Breakwater Beach, Robbins Hill Beach, and Paines Creek Beach. There are also freshwater beaches on Long Pond, Sheeps Pond, Upper Mill Pond, Cliff Pond and Flax Pond. Nature lovers revel in Brewster. A third of the town of Brewster has been reserved for conservation land, open space and recreation. Enjoy Nickerson State Park. Visit the Museum of Natural History, then walk one of the nature trails behind the museum out to the bay. Hike, canoe or picnic in the Punkhorn Parklands. For golfers, there's the public 36-hole Captains Golf Course, and Ocean Edge Resort & Golf Club. Plus there are quaint shops, great restaurants, live theater, craft fairs and plenty of fun things for the kids. Fishermen can head out on charter fishing boats in Cape Cod Bay, or one of the stocked freshwater ponds in town: Long Pond, Sheep Pond, Cliff Pond, Flax Pond, ... Brewster is a beautiful town with great restaurants, beautiful parks, a bike path, a very well stocked library (everyone is welcome to take out books and movies), live theater, and many fine shops. We offer a two week discount. We have supplied this house with everything we could think of to make the 'House on Holly' comfortable for you and your family/friends. Please read the owners submitted reviews (they were copied exactly as written by our guests in the guest book we leave at the house). Thank you!! We hope you consider renting our house as your home away from home. This house is modern, VERY CLEAN, well cared for, very comfortable and sleeps 8 adults and children (plus one infant may stay in your own pack 'n play in the master bedroom). There are four bedrooms and two full bathrooms plus an additional half bathroom downstairs. This set up is great for two families or extended families. Our house is centrally located on the Cape in a lovely quiet neighborhood and you can get anywhere on Cape Cod in 45 minutes or less. Provincetown is only a 35 minute drive, Hyannis is a 25 minute drive. Safely walk with children to the beautiful ponds and hiking paths in Nickerson State park, a 15 minute walk by going out our backyard and down a dirt road. Swim and fish in the park. EXTREMELY WELL STOCKED house: 2 adult bicycles with helmets, a beach cart, at least 8 beach chairs, 2 beach umbrellas, many beach toys, many coolers, 4 fold out chairs in bags to bring to ball games, chef's kitchen stocked with everything you will need, double wall oven, new electric cook top, microwave, hot air popcorn maker, spices, sugar, flour, baking powder and soda, vanilla, cooking oil, vinegar, hot sauce, condiments, laundry detergent, dishwasher detergent, aluminum foil, plastic bags, shampoo, 5 energy efficient air conditioners, over sized washer and dryer, 2 ceiling fans, 5 flat screen TV's, Wifi, many DVD players, comfortable, seating for 9 in living room, children's chairs, toys, books, good reading lamps in every room, and bird seed for feeders. Unfortunately the fireplace is not functional. 2 1/2 bathrooms that will be spotlessly clean when you arrive. Big mirrors (new lighting fixtures in all three bathrooms and magnifying mirrors in master bathroom and half bathroom). Beautiful shower curtains. Anti slip pads provided for both bath tubs. Wonderful outside shower located just outside the queen bedroom. Continuous hot water, you will never run out! Always supervise children as the hot water gets very hot! Five minute drive to the amazing bay beaches, tides go out over a mile. Ten minute drive to famous Nauset Beach on the open ocean side of the cape. In every bedroom, kitchen, and living room. Heat is not needed in the summer. Laundry detergent supplied. Over sized washer. There is space for a maximum of 4 cars. The password is given in the information binder. Front to back air-conditioned living room with seating for 9. The fireplace is not functional. Two wall ovens (new), both offer convection cooking. Sugar, sugar substitutes, flour, coffee, tea, many quality spices, baking products, vinegar, cooking oil, honey, ketchup, mustard, mayonnaise, hot sauce, ..., too much to list everything. Matching quality dishes, glasses, flatware for 12. Lovely kitchen stocked with everything a chef would want including spices and baking supplies. Dish towels and pot holders provided. Flat screen TV's in all bedrooms and in the living room. There are several DVD players in the house and a generous supply of DVD's. Great board games in upstairs closet. A small selection of music CD's. Many good toys for house and beach. Very large library of DVD and VHS movies. Two person settee in backyard raised garden. Another perfect place to relax and watch the birds. Two adult bikes, ride at your own risk. Please repair if you damage a bicycle so that it is safe for the next group. Please do not leave the bikes unattended, even if locked. Newly enlarged front deck patio with two wonderful rocking chairs and a 2-person glider. A perfect spot for morning coffee and watching the birds. 10 stacked patio chairs on the back deck and a very large glass table with umbrella. Many excellent golf courses within 15 minutes of the house. One set of golf clubs stored in the basement. This house has a sunken living room (2 steps down) and narrow hallway and is not suitable for a wheelchair. This home was absolutely perfect! It was extremely well appointed and everything was just perfect! Thank you so much for the wonderful review! We are so happy that you had a great stay and we hope that you consider returning in the future. This is our second summer staying at the House on Holly and it did not disappoint! Marilyn and Bruce have a wonderful home that is clean and very well maintained. 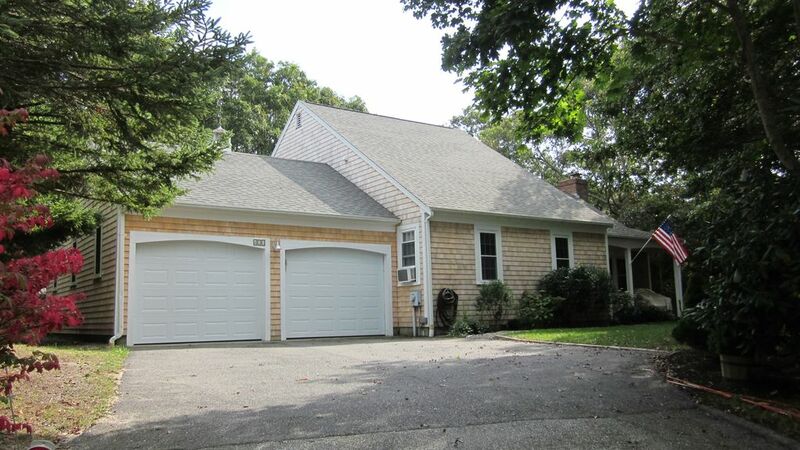 It is tucked away in a quiet neighborhood, and yet close to the Brewster and Orleans beaches. Marilyn is unmatched in her responsiveness to questions and went out of her way to make us feel welcome for our two weeks on the Cape this year. We can't wait to return! Thank you very much for the great review. We are so pleased that you and your family had a wonderful vacation and are thinking of returning in the future. We have been very lucky to stay at the "House on Holly" for quite a few years. The owners treat their guests as family and provide us with nothing but the best of accommodations. The home is beautifully decorated and maintained and the location is absolutely perfect. Just a short walk from Nickerson State Park, the house is virtually minutes away from many Brewster beaches. The owners provide everything for families to have a great trip including but not limited to a wonderrful DVD collection, cable TV, family fun games, beach chairs, umbrellas, toys for kids not to mention a great grill & deck! The front porch is absolutely serene where you can relax, read a book or just watch the birds and chipmunks at the feeder! The owners are special people and their house shows it! Thank you for the absolutely wonderful review. We are very lucky that you both choose to return summer after summer. Thank you again for taking such good care of the house, you are the best! We love staying in this house. We have stayed there for many years. It is very clean. Good space and location for a family. Kitchen well equipped. You can walk or run to Nickerson State Park for swimming, sailing, and biking. Close to the ocean and bayside beaches. Close to food shopping and good restaurants. Very quiet. Thank you for the wonderful review. We appreciate that you have returned for so many summers. Our family enjoyed a fantastic two-week stay at the House on Holly. The owners were very communicative in advance of our stay and went out of their way to make us feel welcome. The house is very clean and well-maintained. It includes a large collection of information about local attractions and dining options. The kitchen is wonderfully well-stocked, as are the upstairs closets, which include all kinds of children's books and board games. Our favorite spot was the front porch with the cozy rocking chairs. A great spot for morning coffee and bird watching. Very peaceful! We hope to return to the House on Holly again! Thank you very much for the wonderful review. Bruce and I are thrilled that you enjoyed your stay at the house and are also considering returning in the future. Thank you for leaving the house in perfect condition! We stayed at the "House on Holly" last summer from 7/18-7/25. It was our 6th year in the rental. We love the house-it so comfortable and well appointed. The kitchen equipment is high end-better than anything in my own house! We just need to bring clothes, towels, and sheets. Everything else in already in the house. Marilyn and Bruce are great-so thoughtful and helpful. I'm afraid to ask Marilyn any questions about the house or contents because I know the item will be installed that same day even if I was just making conversation. We like them so much, we visit them in the off season if we are there at the same time. The location is great, about 1 mile to Crosby Beach. If you walk out the backyard, there is a path leading right into Nickerson State park. We love to hang out by Cliff Pond. And Owl pond is right around the corner. Restaurants and shopping nearby. Can't wait to return on 7/16/16!! Thank you so much for the wonderful review of the "House on Holly". Over the years we have become true friends and it is always wonderful to see you, either during the summer or when you visit off season. See you in July. We are only 5 minutes to Shaws and Stop and Shop, CVS, TJ Maxx, Christmas Tree Shop, and many fine Art Galleries and antique stores. There are many fine restaurants within 10 minutes of the house as well as pizza shops, Wendy's, and a good Chinese or Thai food. I have compiled a notebook with many menus. Golf: Captain's Golf Courses (two 18 hole courses) in Brewster and many other golf courses within a 15 minute drive. A cosigner is required if the tenant signing the lease is under age 30. Once the house is inspected by our professional service, no damage is reported, there is no evidence of pets or smoking in the house, no items have been removed from the house, and you have returned the house keys, your security deposit will be refunded. The security deposit may be forfeited if occupancy ever exceeds 8 people, if any animals are brought into the house, or if any smoking is done in the house. Thank you very much for considering staying at the "House on Holly" for your vacation on Cape Cod.